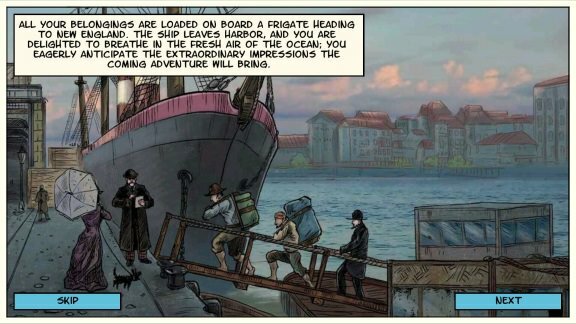 Lovecraft Quest is original comics style game inspired by the works of Howard Phillips Lovecraft - a recognized master of the horror genre. You have to avoid traps, solve puzzles and react very fast fleeing from Lovecraftian horrors which fill the labyrinth of the Temple of Nameless Cults that was built at the dawn of time for worshiping Outer Gods. You’ll meet the lord of the Deep Ones - Dagon, the servant of the Ancients - Shoggoth and, perhaps, Cthulhu himself! The plot twists, life and common sense of the main character depend completely on your decisions. Imagine that you are reading exciting colorful comics. 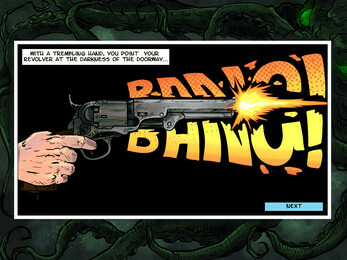 Yet, unlike typical comics, there are a lot of interactive elements in the game - puzzles, alternative endings and inbuilt mini-games. Every scene is drawn by hand with great attention to details and respect to H.P. Lovecraft's works in order to convey the original style of his stories in the best possible way. Minimalistic interface, also in comics style, lets you dive into mysterious atmosphere of ancient dungeons and fully enjoy the story told in the game. After a shipwreck you find yourself on an island, lost in the endless ocean. The only passage from the bay where you came to your senses, looks extremely ancient and full of hidden threat. This is an entrance to the dungeons of the Temple of Nameless Cults. What terrible secrets and beasts are hidden in the labyrinths of this Temple and where careless curiosity can lead - you are to find it all in a captivating comics story. In Lovecraft Quest there are both classic puzzles in style of the good old 2D point-and-click quests and reaction mini-games. Real adrenaline rush is waiting for you in the dynamic scenes where you should decide quickly and choose the appropriate variant of your actions. For example, when you meet one of the beasts dwelling in the dungeons of the Temple, you may try to escape it, choosing the correct door in limited time. The game includes five different ending variants. In best Lovecraft's traditions almost all of them are this or that variant of the main character's death. Be careful with your decisions as the Temple of Nameless Cults is full of deathly traps! Each careless step may become the last one. Still, you can try to find out all the variants of your hero's doom - everything is in your hands! 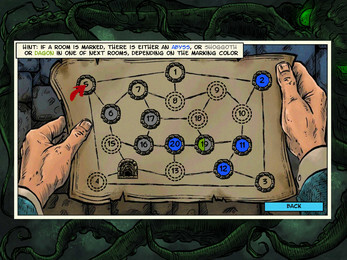 To make your game experience unique, Lovecraft Quest widely uses random events and procedural generation - while creating labyrinths, for example. In some rooms of the Temple you may find artifacts - things from the Lovecraft's stories, such as Necronomicon, a legendary book written by a crazy alchemist and necromancer Abdul Alhazred. This book describes the story of the Ancients - extremely powerful creatures, dwelling beyond the borders of our dimension - and the magical rituals that can invoke them. The legend tells that the original book was irretrievably lost, and that the last of the remaining copies is kept in the library of Miskatonic University, located in the town of Arkham. You may try to find all artifacts and to learn the story of the each. I don't even know where to begin this thing is so awesome! As a person deeply in love with horror comics, H.P. 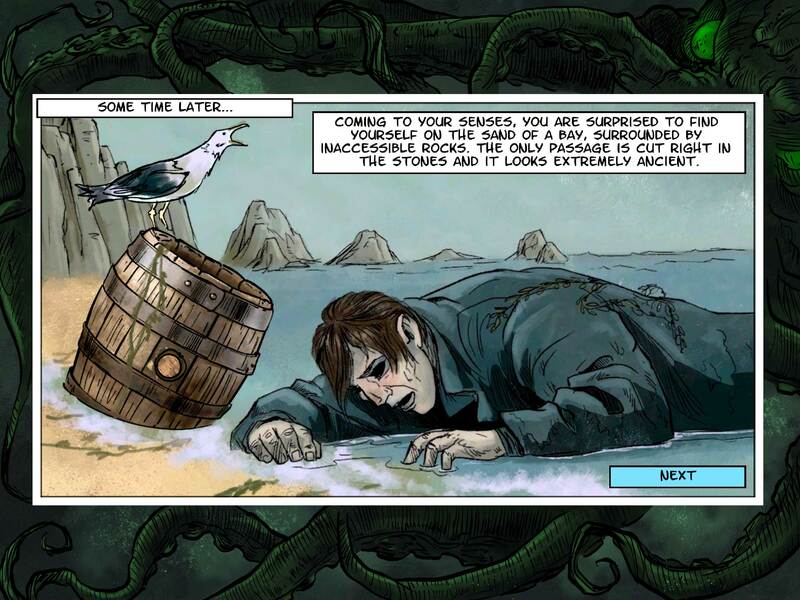 Lovecraft and narrative storytelling intermixed into a game ... it's like all my Christmases came at once! Fantastic, scary, creepy, engrossing, unusual, unique! Please do more of this kind of thing, the game industry desperately needs more upper cortex stimulation instead of lower. For fans of Lovecraft, I would say this is a must-buy!!!!!!!!! If you never added anything else to it I would still consider this well worth the price, but I eagerly anticipate more content/other chapters added to this game! This is like a choose-your-own-adventure with hints of hunt-the-wumpus. Very cool just as it is now, although with a little extra it could be a very addictive game. I would recommend randomizing the rooms a little more with some features and descriptive text plus arbitrary events in any given room. Otherwise, this game is both engaging and spooky and very off-beat. MOAR! P.S. Warning! You will not get far in this game without using a little brainpower! You have to get the map and pay attention or you will die repeatedly on the first level after only a few rooms! Pay attention to the associations on the map with colors to indicate what they connect to. 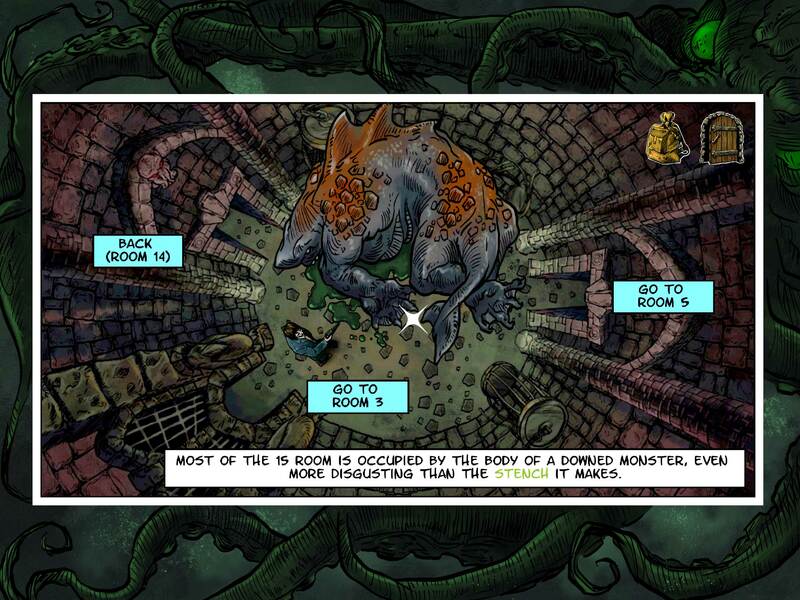 You may also have to confront at least one shoggoth and kill one dagon to make it down to the lower levels! Thank you so much, such reviews help me move on! I'm very impressed of you to notice a reference to "Hunt the Wumpus"! Looks interesting, will give it a try. Android version is available on Play Store now! Please pay attention, this early alpha version of game is not complete and may change in future. If you are not excited to play this game in its current state, then you should wait when I make a little bit more. Any feedback is welcome and helps me to make the Lovecraft Quest better! Is the mimic and that rotation puzzle in the game? It doesnt seem to be and im curious.